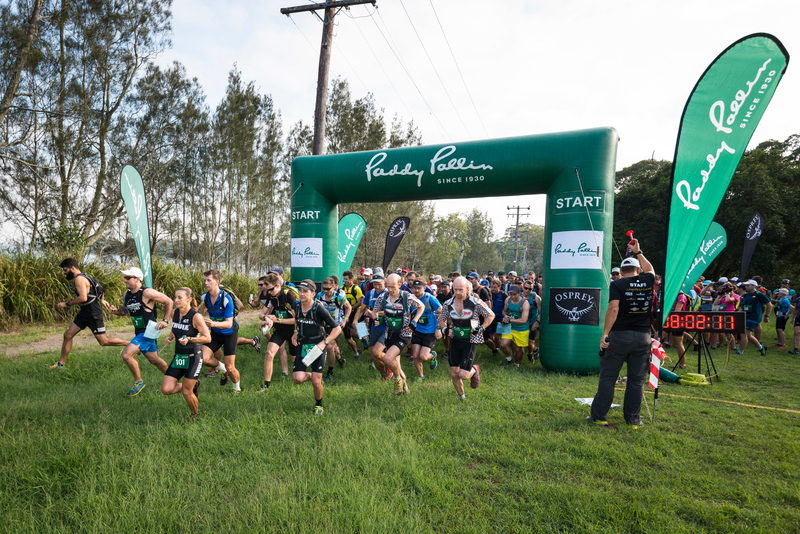 The first round of the Paddy Pallin Adventure Series was run on the 11th March at Lake Macquarie’s Cams Wharf. Due to forecast extreme temperatures pushing into the 40’s the decision was made to pull the start times a hour earlier which proved to be a great move as all races were finished before the expected hot temperatures hit in the afternoon. The course consisted of a great mixture of trail running, mountain biking and plenty of kayaking (which gave the racers a chance to cool off with a splash of water). With over $3500 in prizes from Paddy Pallin, and new supporting sponsor Osprey Packs, up for grabs the competition was fierce. The Classic Course had some tight racing in the men’s category, Andrew Lloyd & Tim Doman came in 1st followed by a dead heat with Chad Armstrong & Ryan Armstrong, Llew Scott & David Corbett and Anthony Schnabel & Luke Mcardle all finishing together in second. Damien Enderby & Jennifer Enderby continued their good form with a win in the mixed and Jane Senior & Vinia Venrooy taking out the women’s race. The novice category that was added in 2016 has proven to be hugely popular with numbers increasing at each round of the Paddy Pallin Adventure Series. The course has been designed for beginners or those teams just wanting a shorter race as its half the distance of the Classic course with lots of families enjoying the day out in the sun. After receiving some Adventure Racing tips from Gary of Maximum Adventure the hooter sounded and the teams where off. Elsie Gretton & Rebecca Sams had the win for the women, Stephen Head & Jason Bush won the mens while Angus Crowe & Enja Prest travelled all the way from Dubbo to take the mixed. As usual there was a large amount of people racing in their first adventure race, coming away with some great stories and big smiles. The nature of the Paddy Pallin Adventure Series makes the day perfect for the weekend warrior who wants to enjoy the outdoors with a friend and have some fun along the way. As bonus all teams who stayed for the presentation went into the chance to win vouchers from Paddy Pallin. Thanks to Osprey Packs for their support and a huge congratulations to all the participants with full results for both the classic and novice courses can be found HERE. To see some more photos head to Outer Image. If you’re inspired and keen to join in the fun all of the locations and dates are HERE.